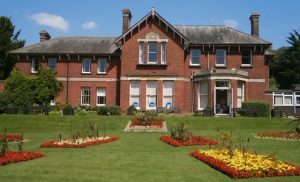 Belle Vue House Sudbury was a new building in 1914, it had been built on the site of the previous building by the Canham family 40 years earlier. At the time of the outbreak of World War 1 Belle Vue was jointly owned by Mr Anstead and Mr. Charles Hooper. 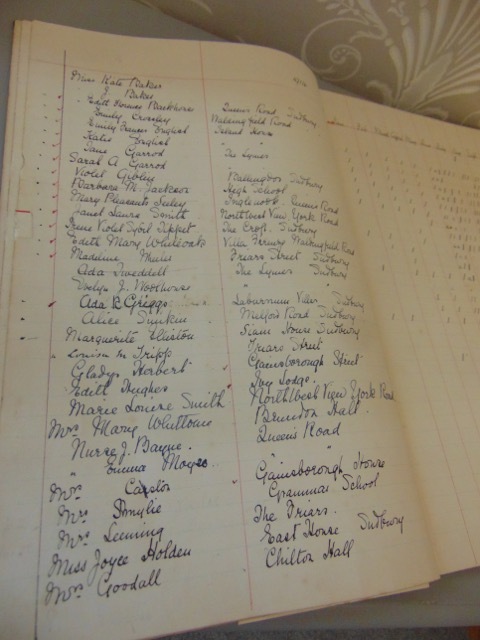 July 1914 the owners loaned the property to Sudbury Town Council for the council to use for specific war work. During the autumn of 1914 the building was prepared as a Red Cross hospital. 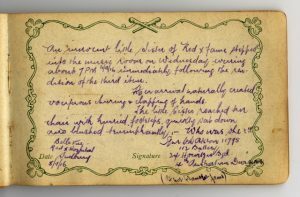 Local women who had signed up as members of the Voluntary Auxiliary Division working for the Red Cross would become very involved with the care and nursing of the convalescent soldiers sent here from the Front. 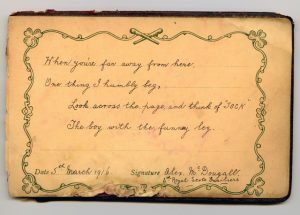 The first soldiers arrived at Belle Vue on 1st February 1915 and mainly suffered from frost bite. At first there was no interaction between the patients and the Sudburians except for the nursing staff. The patients were very fond of the nursing staff and have left signatures, drawings, cartoons and poems in the autograph books held in the Sudbury Ephemera Archive. 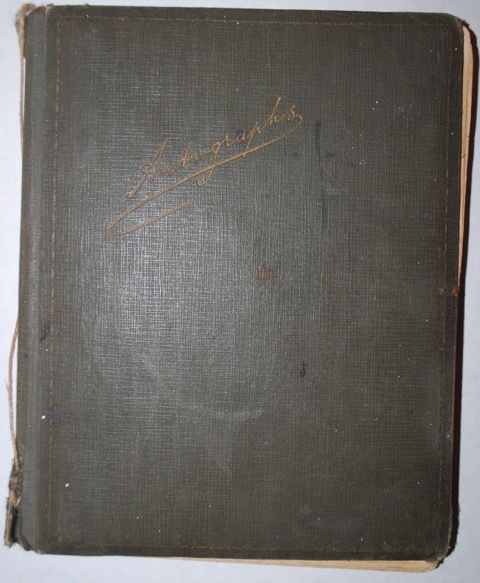 These books show the standards of literacy of these men and in some of the entries we are able to discover where they were injured, their regiment and army number. The soldiers who found themselves in Belle Vue did not necessarily come from Sudbury or Suffolk, many had homes in the north of England or Scotland and some even found themselves here but their home was Canada, Australia or New Zealand. 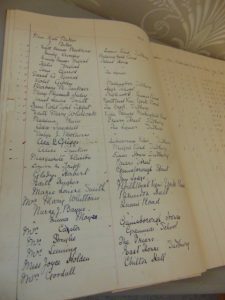 SEA has prepared a database of details about these soldiers, unfortunately many are difficult to trace due to destruction of records at the Ministry of Defence during the World War 2 Blitz and the changing details which occurred when many returned to the Front. It is one thing to be able trace a predecessor’s name, date of birth and death but to actually find copies of handwriting forges a link to make the researcher feel that the ancestor was a real person. 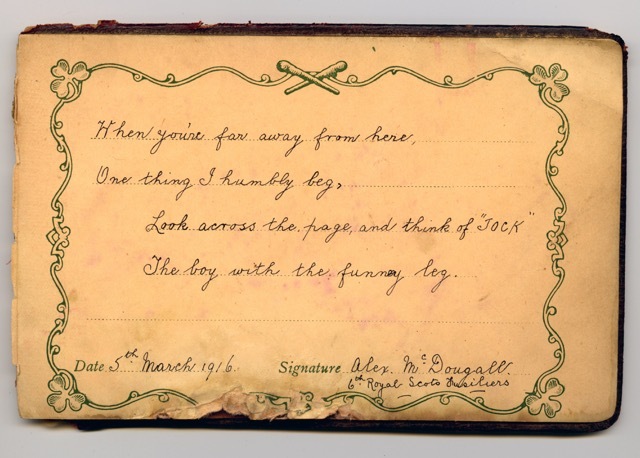 Hugh Shields was a regular soldier, who had been born 1885 at Whitton Park, Bishop Auckland. Hugh was 5feet 3.5 inches tall with auburn hair, hazel eyes and a fresh complexion. In 1911 Hugh Shields was stationed at Colchester barracks with the Durham Light Infantry. 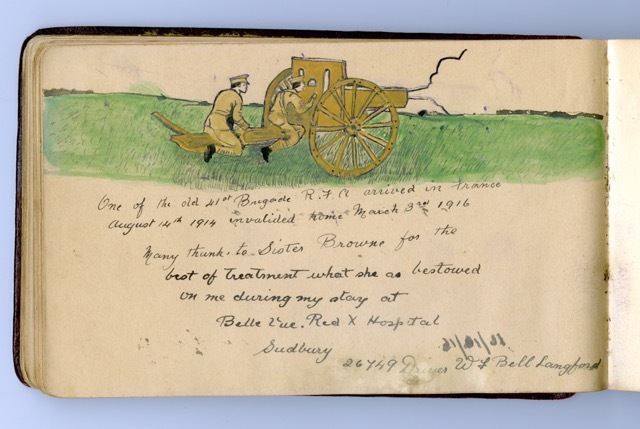 It seems that Hugh was convalescing at Belle Vue Hospital on 2 occasions, in 1916 he was recovering from a shrapnel wound to the shoulder received at the battle at La Besse Dullet. 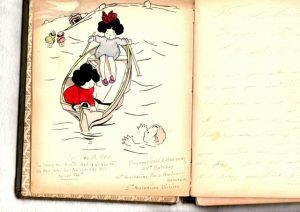 Hugh was a prolific cartoonist in the autograph book belonging to Sister Helen Browne. 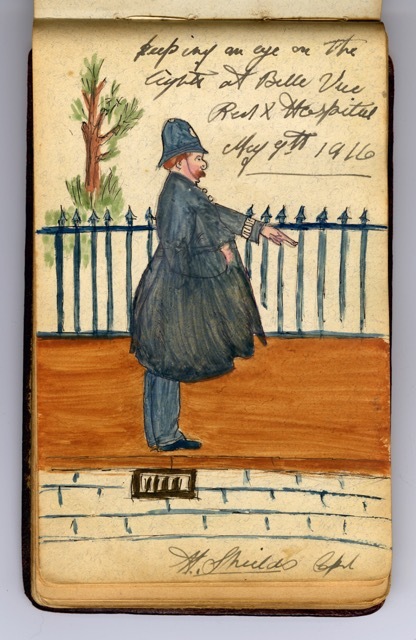 His work is often similar to the illustrations of Mabel Lucy Attwell but some are more individual and take a look at the Sudbury Police Force and the attitude towards the convalescents. After the war Hugh left the army for a life in civvy street. 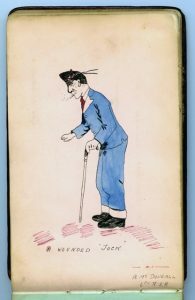 Alex McDougal was a soldier from the 6th Scots Fusiliers who was sent from Ploegstreert in February 1916 he was also a cartoonist and often portrayed himself as the man with the injured leg. 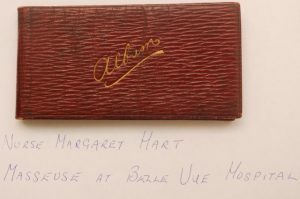 Alex also wrote in Sister Browne’s book. 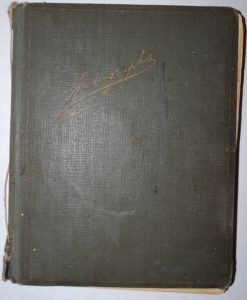 The entries in the book give an insight into some of the things the invalids did to pass away the time one such entry refers to a concert at which the guest of honour was Sister Browne. Perhaps one of the more moving entries is that of W Bell Langford, Royal Fusiliers artillery 26749 which is a well painted picture of the guns at the front. 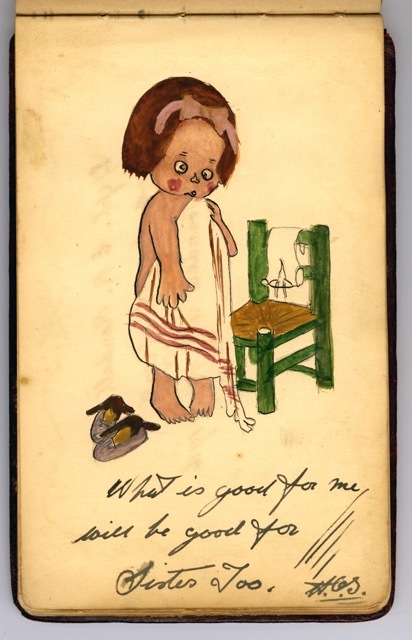 The autograph books also gives us the chance to trace some of the VADs who were involved in nursing troops, only half a century before this work had been regarded as a very unsuitable task for women from respectable families. As the war progressed the patients and towns people mixed more freely. 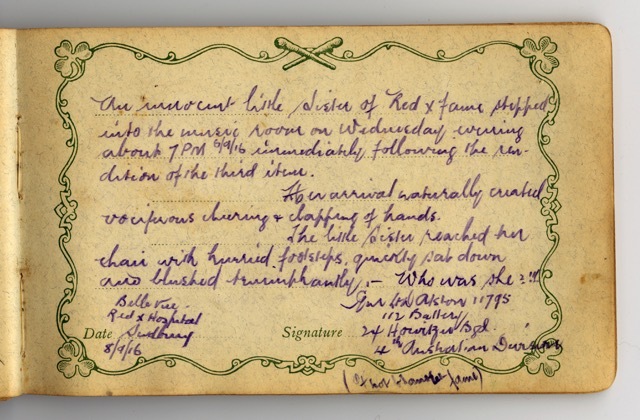 The wounded were described in the local press as attending military weddings at a local non-conformist chapel. 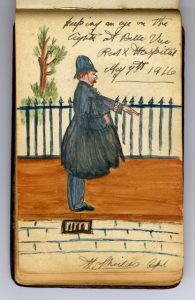 Soldiers from Canada, Australia and New Zealand who were expected to return to the front often went for trips on the River Stour and an Australian soldier drew his image of this excursion in Madge Sewell’s autograph book.